This is zany and wild interpretation of magic. 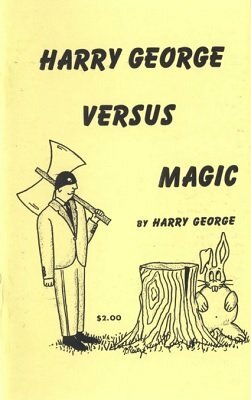 Harry George is a man who plays only for laughs. All the ideas in his ebook end up in a laugh! Over two dozen tricks of all kinds in the very amusing ebook, delightfully but zanily illustrated by Tom Rietze. For fun in your magic, or magic in your fun, get this. Is This The Write Pencil? 1st edition 1965; 1st digital edition 2016, 65 pages.